Blog Thank you Water Festival volunteers! Thank you Water Festival volunteers! 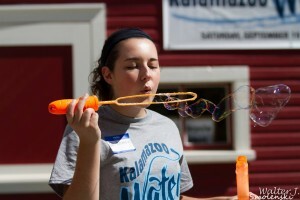 In September we brought back the Kalamazoo Water Festival after a five year hiatus. Since the last festival lots has happened on the Kalamazoo River, its tributaries, and the watershed and we were ready to celebrate all of the good work that has been accomplished. The festival was a great success and we owe a huge “THANK YOU” to the many volunteers who came out to help for the entire day. We were so overwhelmed and excited by the huge response we received when asking for community volunteers. We could not be more pleased with those who volunteers and others in attendance at the festival for your enthusiasm and dedication to our precious natural resources. It proves once again that together we can do great things.